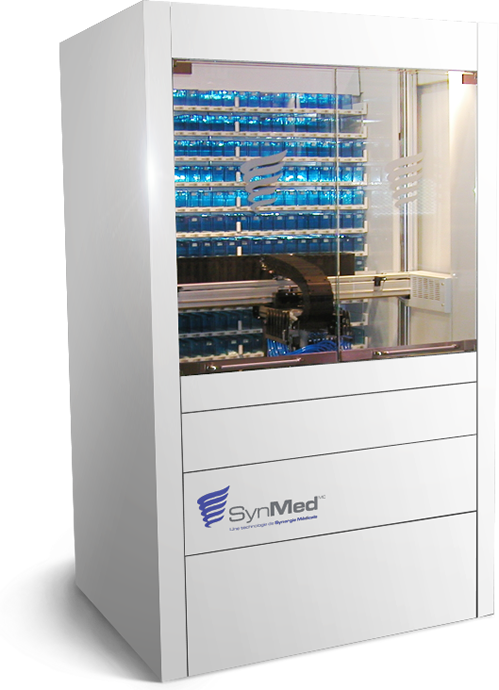 SynMed® is an automated system for preparing and dispensing solid oral medications in blister cards. SynMed®‘s specific functionalities provide many competitive advantages that let you rapidly implement blister card automation. All prescriptions can be dispensed using your choice of packaging 1) Multimeds trays or 2) Flex trays ; the latest innovation in medication management which is specifically designed for use in the residential care setting. We are the only supplier of Flex trays which we have procured and imported from the US. In addition to all of the functions offered by Multimeds, they offer a patient photo on each Pod. The packaging is also smaller and lighter and has the Kardex integrated into the top of the packaging and the Tick tac on the back for ease of administration. We grant all of our care homes access to our cloud-based care meds system which holds all patient PMR’s. This application provides staff with secure and convenient access to resident medication records.